High-speed rail is capable of reaching sustained speeds of 350km/h or more, with new lines in excess of 250 km/h and existing lines in excess of 200 km/h widely considered to be high-speed. These systems are already extremely popular across Europe and Asia, most notably in France, Germany, Spain, Japan, South Korea, Taiwan, and China. Despite starting out just 20 years ago, China's high-speed rail system has quickly developed into the world's most extensive network, accounting for more than 60 percent of the world's high-speed lines. With the California High Speed Rail system already in construction and the possibility of the world’s longest high-speed line being developed between Beijing and Moscow, fast rail travel has become a viable option for passengers across the world. 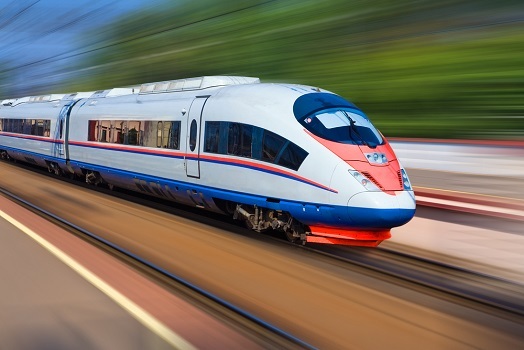 High-speed systems are currently being developed in all corners of the globe, including a line between Morocco and Tunis in North Africa, a line from Astana to Almaty in Kazakhstan, and a line connecting the three biggest cities in Iran. New high-speed rail infrastructure is also under construction across Europe, including the Copenhagen–Ringsted line in Denmark and a number of lines across Sweden. Along with work already under construction, there are lots of proposals for new high-speed systems in countries as diverse as South Africa, Saudi Arabia, Indonesia, Vietnam, Norway, and Russia just to name a few. While there has been numerous proposals to develop a high-speed network in Australia between Sydney and Melbourne via Canberra, the huge distances and small population make it a difficult commercial proposition. A high-speed local network has also been proposed in Auckland, with the relatively small population of New Zealand also making this a challenging investment. Most high-speed rail systems use an advanced version of conventional rail technology, including the French TGV POS, German ICE 3, and Japanese E5 and E6 Series Shinkansen systems. These trains have a maximum commercial speed of 320 km/h, only beaten by the Shanghai Maglev Train in China which reaches speeds of 431 km/h during its daily service. The Shanghai Maglev line is the first and only commercially operated magnetic levitation line in the world, a technology also being developed by the forward-thinking Elon Musk and his Hyperloop One project.